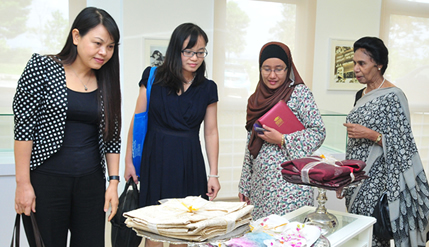 BANGI, 15 Nov 2013 – The Tun Fatimah Hashim Women’s Leadership Centre of The National University of Malaysia (UKM) is to undertake cooperation with Vietnam Women’s Union (VWU) in line with its objective of training women to be leaders and important decision makers. This follows a visit to the Centre by a VWU delegation here recently led by its Vice President, Dr. Nguyen Thi Thu Ha. She was accompanied by Ms Tranthi Mih Huong from the Union’s International Relations Department. Director of the Centre, Asso Prof Dr Madeline Berma hoped the visit will be the starting point for the two entities to cooperate in the development of women in both countries. She said the centre undertakes research into women and organise activities and training for them. “Our challenge is that though 70 percent of universities enrolment in Malaysia are made up of female students, women still make up only 40 percent of the work force and even less as top level decision makers. The Malaysian government was now encouraging employers to hire more females and to also place them among the top decision makers not just in the corporate world but also elsewhere. Thus training women to be leaders was becoming more important than ever, Dr Berma said. Present during the visit were Vice President of NCWO Dato’ Ramani Gurusamy; Marketing Manager of Wanita Inspirai Negara (WIN), Sukma Buyong ; Managing Director WIN, Puan Sri Devi; Tun Fatimah Fellows, Prof Madya Dr Faridah Shahadan and Prof Madya Dr Zaharah Hassan, Cik Rozita Ibrahim and PhD students Zahra Khajeh (from Turkey), G.T. Madhubhash (Sri Lanka) and Nadia Abas from Wedding Design. VWU has 15 Million members across Vietnam and has its own Academy where it teaches and train young women to be leaders. Dr Berma said the Tun Fatimah Centre welcomes an MoU for cooperation between them.